I decided to start doing some paintings of supporting stars (yes, I know, this isn't a painting... I felt like sketching tonight instead. But tomorrow, when the painting bug is sure to bite, this sketch will magically appear on my blog transformed into a pop art painting) Anyway! I decided a long time ago that I was going to do this series, and I have the most incredibly fantastic stupendous name for the series-- actually my dad came up with it-- thanks Daddie! -- are you ready? It's really good!!! First Rate Second Bananas!! Now you may be thinking to yourself, "second bananas... supporting stars... but what about M and Mad Love and the Mr. Moto series? Peter Lorre was no second banana, he was a STAR!" and you are very right. But in my book, you don't have to be one or the other, you can be both. While Peter Lorre WAS the star in a huge amount of films, he is probably better known for his outstanding supporting roles, like Joel Cairo in The Maltese Falcon, Ugarte in Casablanca and Dr. Einstein in Arsenic and Old Lace. In these films, he was really a first rate second banana. My personal favorite of Peter Lorre's supporting performances is as Dr. Einstein in Arsenic and Old Lace. Arsenic was actually one of the very first movies I saw after my conversion to classic film. Not long after becoming enamored with the movie, my parents treated me to tickets to see a live stage version of the movie. I've seen only a handful of theatrical versions of my favorite movies, and usually I am very underwhelmed. I just expect the actors on stage to be as good as the actors on film and that is a really, really hard expectation to meet. At Arsenic and Old Lace, I was mildly satisfied with the lead actors, but the absence of Peter Lorre created a gaping hole in the production. While his part in the film is relatively minor, this play made me realize how much his presence means to the overall story. Without him, it just wasn't nearly as good. That's a fantastic sketch, & a great idea for a series. I'm totally with you on Lorre's Dr Einstein role-- "Arsenic & Old Lace" is such a hilarious film. I see that you watched Tales of Manhattan! - my favorite sketch is the one with Ginger Rogers and Henry Fonda. Which one did you like best? Great sketch! I think he deserved more recognition than he got. I've given you the Premio Dardos! Details are on my blog. That's a really fantastic sketch! I love Peter Lorre, He was such a versatile actor. I saw him first in "Arsenic and Old Lace" when I was 12 or so, and ever since I've been a huge fan! 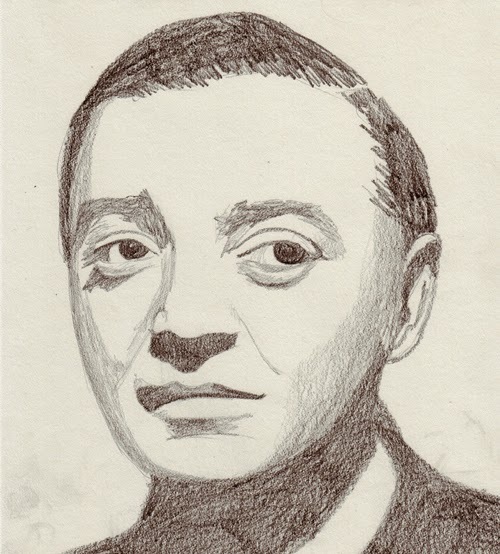 Peter Lorre... amazing actor, M is a revelation. very cool blog, can't wait to see what you might do with; Vincent Price, Boris Karlof, and Elsa Lancaster. Excellent sketch! I just adore Peter Lorre. He is absolutely my favorite character in "Arsenic"! Have you ever seen "My Favorite Brunette" with Bob Hope? It's Bob's spoof on detective mysteries...especially spoofing "The Maltese Falcon". Peter Lorre is in it, and he is amazingly funny! As the "suspicious gardener", he is spoofing many of his famous roles. Oh, Kate, I have also given you the Premio Dardos award. You can check out the info on my blog. Love it! I've been missing the pencil sketches. I've always been a fan of his too. First movie I ever saw him in was 20,000 Leagues Under the Sea. Never knew he played so many bad guys until much much later in life! I particularly liked him in Cross of Lorraine. "How do you think I feel about it?" John- Thanks! Really, Dr. Einstein is one of my favorite characters in any movie ever. casey- Thanks! I'm part Hungarian, too, although I only found out that Peter Lorre was Hungarian when I was looking for his picture last night! I always thought he was German. My favorite segment of Tales of Manhattan is the Charles Laughton one. The part with the audience and the jackets gives me goosebumps! Sarah- Thanks so much for the award! It really means a lot to me :) Congrats on getting it yourself-- you really deserve it! Elizabeth- Thanks! I think I saw Arsenic for the first time when I had just turned 13, and it really struck a chord with me, too. Iren- I completely agree with you about horror fans and musicians still remembering him. I did mean that he has largely been forgotten by the mainstream. You bring up a really good point about musicians honoring classic film stars, though. A lot of alternative bands pay homage to them, and that shouldn't be overlooked. In fact, my first memory of Bela Lugosi isn't from any of his movies but from hearing his name in the Bauhaus song "Bela Lugosi's Dead" that my dad used to play when I was little. Millie- I haven't seen My Favorite Brunette yet... I haven't really been a big fan of Bob Hope, but I did just see one of his films with Bing Crosby and he was pretty funny. I think I'll give him another try. And thank you for the award! Congratulations for getting the award, too! DKoren- I've been missing the sketching, too. It's a lot less messy than painting, which is great because I have two very curious cats who would probably sleep on my wet palette if I didn't clean it up every time I paint! I haven't seen Cross of Lorraine yet, I'll have to rent it or record it next time it's on! K.- One Eugene Palette sketch, coming right up! If I can't do it tonight, I'll try to do one tomorrow! This is a smashing sketch and well suited to mr Lorre's shadowy roles. This Lorre sketch is one of your best sketches yet! Ginger- very Seussian. I desperately want to paint Eric Blore but I can't find any good pictures.. I think I may have to do a screen capture from a movie in order to get a good one. Don't you wish EVERYONE was an Eric Blore fan? The world would be oh so nicer. Great sketch! I love Peter Lorre -- long-time fan, since 1973. Have you read his biography, The Lost One: A Life of Peter Lorre? Official website. And a Peter Lorre blog -- Peter Lorre News. Thanks, Kate! Always glad to help out a fellow Lorre fan in finding out about his biography. Glad you're enjoying the blog, too!